New Delhi, Aug 26, 2015: What connects Bisi Bele Hulianna, Saaru, Modaka, Huggi, Majjige Palidya and Drakshi Gojju? These are some of the famed dishes of the Madhwa Brahmin community of Udupi, a coastal town in Karnataka where the Krishna temple acts as a pivot in people’s lives. Laying out the geographical expanse and scientific logic to the regions Madhwa Brahmins vegetarian food habits, culinary expert Malati Srinivasan and arts and crafts connoisseur Geetha Rao showcase the hitherto unknown vegetarian recipes from Udupi in their book "The Udupi Kitchen." The authors straddle the traditional and modern and list what was once easily cooked in Udupi households - spice powders, salads and chutneys, savoury snacks, desserts - and elaborate on several recipes which are all-time favourites like Bisi Bele Hulianna, Saaru, Masal Dose and Modaka. While Bisi Bele Hulianna is a dish of spicy red gram, rice and vegetables, Saaru is spicy red gram soup, Huggi is rice and green gram with black pepper and cumin and Modaka is dumplings with coconut and jiggery filling. Majjige Palidya is ash gourd with coconut and cumin in sour yoghurt and Drakshi Gojju is raisins in sweet, sour and spicy gravy. Split into 12 sections, the Udupi Kitchen, published by Westland Ltd, celebrates vegetarian food with aplomb from a town where food is religion as well as a complete mouth-watering experience. At the core of Udupi cuisine is the use of indigenous vegetables and fruits, cereals and pulses special to the Parashurama Kshetra and traditional Brahmins ate only vegetarian fare without onion and garlic. According to the authors, Udupi cuisine has a vast variety and is not limited to tiffins or snacks. "As I began working on this project, I realised how vast and varied our family’s repertoire of Udupi (Madhwa) cuisine was. I wrote down 175 recipes, but have used about a 100 of them in the book," says Srinivasan. "Writing a cook book for both Indian and non-Indian readers required that a comprehensive multi-lingual glossary be compiled. It also meant using internationally accepted terminology: ’henchu’ or ’tava’ became griddle, bandle or ’kadhai’ became wok, ’tappele’ or ’bartan’ became saucepan," says Rao. She says for some kitchen tools like ’eelgemane’ and ’ogarane chamcha’, which had no "internationally understood" words, substitute words like curved knife blade and tempering-ladle had to be coined. The story of Udupi cuisine is the story of how a temple-based, Brahmanical culinary tradition got modernised and became a global phenomenon. Food is religion in Udupi. Fourteen varieties of food are cooked daily and offered to the deity at different times of the day. The food offered to god is ’naivediya’, and the food eaten by human beings is ’prasada’, food that is blessed. In Udupi, meals are served on banana leaves in a particular order. Many recipes and foods have also proven health benefits. For example, dishes made from the inner banana stem prevent kidney stones, pepper rasam helps with the lactation of new mothers, jackfruit seeds have high protein content and so on. The authors also say that the original of the masal dose or the famous masala dosa is attributed to Udupi. Before it was invented, plain dosa was served with potato playa, without onions, in a separate cup. With changing food tastes, the Udupi chefs began to saute the mashed potatoes with onions and spices. "As onions were considered taboo food for orthodox Brahmins, it is said that the doses were stuffed with onion-laced playa, instead of served in a separate cup, so that the onion could be ’hidden’," the authors say. 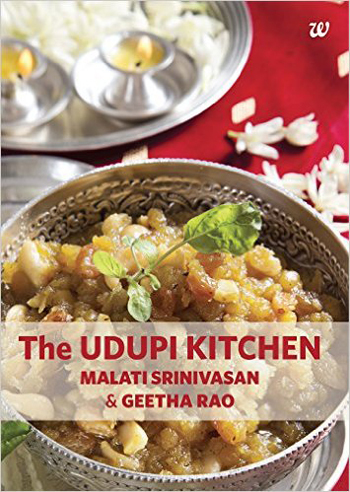 Thanks to Malati Srinivasan and Geetha Rao for their gift to the society by providing the secrets of Udupi kitchen.